Stacking wood or clearing brush, hard-working hands deserve the durability of cowhide leather. These men's work gloves are made of sturdy cotton duck with a cowhide leather palm, reinforced patches, and knuckle protection. Insulation keeps hands warm. I would not recommend buying these gloves. The gloves are tighter than they use to be. They are not as durable, either. The fingers are already sliceing off layers. There also is less insulation to keep your fingers warm. I miss my old gloves. We're sorry to hear this. Please contact us at 1 800 833 3118 so we can look into these concerns. Warm. Great for morning work. Fit is true to standard gloves. We're sorry to hear this. Please feel free to contact us at 1 800 833 3118 for further assistance. Perfect gift for my dad as he starts his retirement gig on my brothers “farm”. These gloves will work well when I am working outside doing construction. Great quality and the material is thin and warm. I like this glove . Heavy duty and won't fall apart . 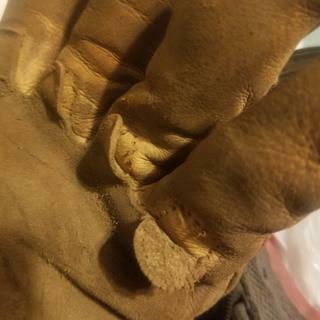 This is your basic cotton/leather work glove, insulated for winter. I don't understand why we reviewers differ on sizing opinions. I have long fingers, relatively slender for a 250 pound guy. My hand measures 9 inches, precisely a large on the size charts. I recently ordered gloves from another well-known retailer and couldn't even force my hand inside, but reviewers there almost universally complained about small sizing. I consulted with Carhartt before ordering their gloves and was recommended to try XL and 2XL, based on my experience. These gloves in XL were wearable, but just a little small and short in the cuff for me. The 2XL is the best fit for my "large" hand. Considering my experience with both companies' sizing, I'd recommend you err on the large side unless you like a tight glove. Call or chat with Carhartt before ordering...coat sizing is on the money, but something's odd with gloves. I'm happy wearing a glove two sizes over, and it's mostly girth and cuff length, not finger length, as the reason. Awesome durable glove providing warmth and durability as I work outdoors a lot. Thank you Carhartt!! Very disappointed carhartt , I've only had these gloves not even two weeks. 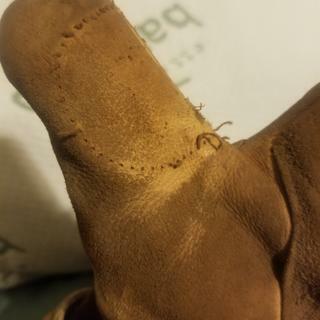 The left thumb support over the thumb came unstitched an came off as well as on the right glove on the palm support piece is starting to come off as well. They are very warm I do like that an easy to work on. I'm outside all day with them grinding sanding and painting. But the quality I'm definitely not happy with cause winter has not even started yet an there falling apart already literally:(. They are good gloves. They perform as advertised. They perform as advertised. They provide warmth and flexibility. Very nice, heavy, warm gloves. The weight, however, is not so heavy that it interferes with your work. Comfortable from the beginning you put them on. Awesome gloves! Great warmth but durable for working outside. So glad i purchased these gloves. Quality! these gloves are great quality and were a great purchase I would by them again. I work with a group called the weed warriors pulling out weeds and wild rose and replanting with native plants. I'm in Northern NJ and it's cold out here now. These gloves keep me nice and warm and protect my hands from the rose thorns. Being female, I figured Mens small would be the right size. Mens small fits perfect, a little to perfect. I probably should have ordered Men's Medium. These are doing fine though. We'll see how they hold up through an entire winter and tons of wild roses. For the price, they are excellent. BEST ANSWER: Please contact us at 1 800 833 3118 so we can look specifically into the products you are interested in. Is there any warranty on gloves? BEST ANSWER: Please contact Customer Service at 1 800 833 3118 for further assistance. Would these be a good glove for running a chainsaw in the winter? BEST ANSWER: Yes they are good gloves for operating chainsaws. I have never experienced any problems while running a chain saw when wearing these gloves. They are flexible enough to allow you to operate the chainsaw while keeping your hands warm. Yes these are great for chainsaw work! My husband LOVES these gloves. He works outside all year and these have been awesome! Yes it would definitely be they keep yours hands warm and the fabric they are made off is really strong and durable. How would you say the size of the gloves run? BEST ANSWER: I have long fingers that are relatively slender for a 250 pound guy. My hand measures 9 inches, precisely a large on the size charts. I recently ordered large gloves from another well-known retailer and couldn't even force my hand inside; reviewers there almost universally complained about small sizing. I consulted with Carhartt before ordering their gloves and was recommended to try XL and 2XL, based on my experience. These gloves in XL were wearable, but just a little small and short in the cuff for me. The 2XL is the best fit for my "large" hand. Call or chat with Carhartt before ordering. I'm happy wearing a glove two sizes over, and it's mostly girth and cuff length, not finger length, as the reason. BEST ANSWER: We apologize we do not show any retailers in your area that may carry this style. You are welcome to order from us directly. How does these gloves hold up as far as ironwork is concern? BEST ANSWER: We do not specifically rate them for that industry, but they are a tough glove. I work for a tree service and they held up to both jobs they keep my hand worm and they are great quality. most definitely a awesome purchase! My husband doesnt use them for ironwork, but he uses them in the yard and for all sorts of activity. They are very comfortable and warm. Why is the medium size out of stock? THAT is so annoying!!! BEST ANSWER: We apologize we are out of stock of size medium. We expect to replenish stock around March 2017. Want in Carhartt Tan, is it available? BEST ANSWER: It comes in Carhartt Brown, which is our classic color. BEST ANSWER: We measure by hand circumference. Please click on the size and fit guide once you are on the product details page. I ordered a size small cause my son is just 13 about ready to turn 14 in March. He is going to school in Stockton, MO so I have not heard anything yet from him but will post when I do! How do these hold up in working in the rainy Oregon weather? BEST ANSWER: I love them, though they are not waterproof. They will certainly hold up when wet, but your hands will be wet. Great for tough work, firewood, dirt, protecting hands in rough areas, etc. My 2nd pair - best work gloves I have ever had. funny you mention that I youse to live in Oregon but yes they will definitely hold up that kind of weather but they are not water resistant.